Our range of products include mortuary chambers. Avail from us a wide array of Mortuary Chamber that is manufactured in accordance with the defined industry standards. 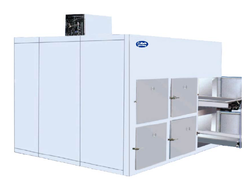 All our mortuary chambers are double walled and have excellent refrigeration control. Moreover, our chambers also helps in preventing decomposition of dead bodies for a longer period time. Further, before supplied to the customers, these are stringently tested to avoid any defect. Looking for Mortuary Chambers ?